A beach and surf lover’s paradise, this secluded beach and oceanfront property with a classic Mexican Hacienda architecture design and interior decor is the perfect blend of Mexico in tropical paradise. Casa Regency has 4 bedrooms, each with unique bright colors, some blues that bring the ocean feel right into your bedroom. This property integrates a pool adjacent to the main home and is bordered by a tropical riverbed, surrounded by lush tropical gardens, and on the sand, which is located right in front of the main gate, there is a private palapa bar with bar stools overlooking the majestic blues of the Bay of Banderas waters. What better way to enjoy a cold Margarita than with family and friends under the sun and with your toes in the smooth sand of the famous ‘Burros’ beach. 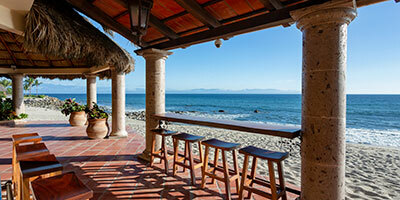 Punta del Burro was the first residential beachfront subdivision to develop on the Punta de Mita peninsula along the North Shore of Puerto Vallarta, Mexico. A highly sought after location for the cognizant, coveted for its privacy and safety, the beach community is apart from a towns or village and is with gated 24/7 security.Though, the town of Punta de Mita is only a 10 minute drive away, where you can enjoy shopping and diverse culinary options.